Michael Wendell was able to take his camera inside the site, which he says has not been added to since the early 1970s. He tells Telstar Logistics that the owner appears to be a hoarder, with pieces and materials stuffed inside several of the planes. The relics include the Vought F7U Cutlass above, a P-51 and a B-36. 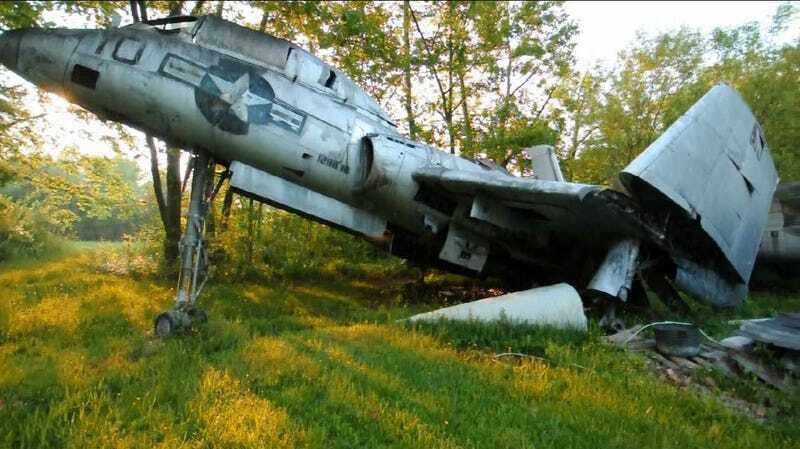 Wendell's video suggests exposure to the Buckeye State elements hasn't been kind, and there's enough vegetation growing under and through some to suggest the planes may never move again. Airplane Junkyard - Northeast Ohio from Michael Wendell on Vimeo. UPDATE As several of our eagle-eyed commenters have noted, the site belongs to Walter Soplata. His son Wally wrote in 2007 that several of the planes once on the ground have been given to museums and restored, and that while the site was once open to visitors, it's been closed for several years.